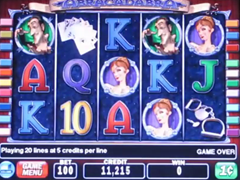 Abracadabra Pokie Review - Play Today! 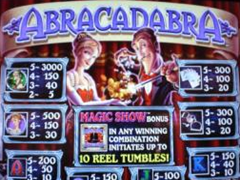 Abracadabra is the name of a popular slot game made by IGT. This type of slot games can be found all over the place in casinos throughout the country. In fact if you walk in almost any Las Vegas casino, you can find at least a few Abracadabra slot machines. This is also the moment when you will realize how popular this game is. When you first start playing Abracadabra you will enter the world of magic. There are 5 reels on which you can activate up to 20 pay lines. While this might seem a little bit more difficult to play compared to the classic 3 reel games, you will get to understand how everything works pretty fast. The average payout of Abracadabra is situated between 85.9% and 98%. This is considered to be a very high payback percentage compared to what’s available at other machines and it won’t be long before you can cash in some nice prizes. The payout is considered to be large enough to be able to provide you with enough winnings that should be able to keep you happy. The maximum amount of credits you can bet on one spin is 400, while the maximum win amount is capped at 60,000. This is a game made for everybody. No matter if you are just a simple casual player looking for a penny slot, or you are planning to play it as a high roller, Abracadabra is the game for you. However you should always take into account playing the game with caution, as it can make a big pile of money appear and at the same time it can also make your bankroll disappear. The bets start from as little as $0.01 and go up to $4. This way even if you activate all the pay lines, you won’t have any problems parting with your money too quickly during those unlucky playing sessions. One of the things that helps Abracadabra excel is the high hit frequency for the bonus round. This means that while playing the game, you will have some higher chances of hitting the right combination of symbols that could get you playing the bonus round. Activating the bonus is simple all you have to do is to get the “hat” symbol in a winning combination of symbols. It looks simple and it will get activated statistically 29% of the times you spin the reels with all pay lines activated. Since Abracadabra is based on a magical theme, you should never expect your money to disappear. Instead you should start seeing some nice piles of money appearing in your pockets at the end of the playing sessions. This is a land based casino slot game and it proved to be very popular so far. Another nice feature of Abracadabra slot game is that it uses a ticket dispensing cash out system that allows you to cash in your winnings fast and without any worries.